Of course my plan to get out first thing this morning to do a little oil painting never happened. This despite my gushing over how happy I was to have them back. As always I had things to do in the house. I think maybe what I need is a set of horse blinders, you know so I can’t see dirty dishes, dust, or the cat hair tumbleweeds that have been known to travel through my house. By the time I sat down to work it was no longer daytime, but actually about 8:15. I’m just about a third of the way through my project and time management remains an issue for me. That is, I manage to find time for everything else but my art. I will again attempt to make a promise to myself that my art will become a priority, but I think we all know that it still falls under the ” I’ll start my diet Monday” category. I’m beginning to think that it won’t happen until it is supposed to. By that I mean that we all make promises to ourselves and others, and despite our sincerity when we make them, the promises go unmet until the planets align, or the earth spins the other direction, or our brain just kicks in. I’m hoping that one of them happens soon. I find myself so tired by the time I start that sometimes I don’t feel like working. I can’t keep letting that happen. I did eventually work tonight, in oils, indoors (don’t tell Dan). I had a small square canvas I painted black some time ago. I grabbed it, not sure of what I would paint, but as I walked out of the studio I noticed one of the boutonnieres from my daughter’s wedding sitting near the door. It’s been nearly four months since the wedding and I somehow have ended up in possession of two or three bridesmaids bouquets, three or four boutonnieres and the bride’s bouquet. Actually, I am keeping Jessica’s bouquet because otherwise her pug, Otis the mini-terror, will have his way with it. (He is very cute, but oh so naughty!) 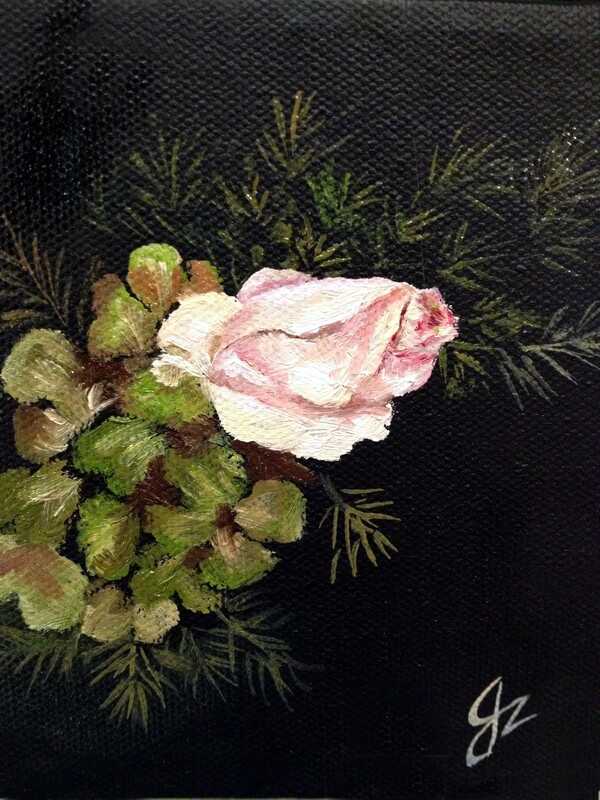 I love the look of the dried roses and hydrangea, so I decided to paint those. My canvas is only about four by four, and I really did only a quick study, but I do like it very much, and I LOVE having my oils back! Oils, tomorrow we shall meet again! By the way, isn’t it Superman that can spin the world backwards? Does anyone know a guy with tights and a cape? The thing about being in the middle of not great stuff happening in your life is that the really important things, the things that really mean something, start to stand out even more. I think we as society get so caught up in work and money, and the race of every day life we sometimes tend to only look at the big picture, and lose sight of the small things, and most of the time those are the things that mean the most. I have a beautiful home, and it’s full of beautiful things, but these days I find myself not caring about “stuff”. Instead I find myself appreciating what it means to have a home when so many people don’t, and being grateful that we had a little money when trouble hit. I have been married for twenty-four years, and have been spending every minute of every day for the last three months with my husband, and what has come out of that is the really, really important stuff. Such as? Despite troubles, a lot of support, a lot of understanding, a lot of worrying together, surprising to some, a lot of laughter, and most of all a lot of love. I was thinking about that earlier today and it inspired what I did tonight. I was in the mood to something different. I have a couple of photos I’ve taken over the last few years of hearts. Not the typical Valentine heart, but just noticing the shape in structures, in nature, and weirdly in a tar formation in a parking lot. inspired by what is the focus of my life these days, and the photographs I’ve taken, I wrote a verse and created a collage. Collage is definitely outside my comfort zone. The randomness of it is at odds with the perfectionism issue I have. I only know this, whatever happens in our life we will always have what’s important, and that is each other. My only artwork for today happened in my kitchen. We actually started our day at 6:00 with a garage sale. Someone needs to remind me the next time I say I’m going to have a garage sale how much I hate it. After that a quick house cleaning, and then we had friends come for dinner. That’s where today’s creativity kicked in, handmade ravioli with ricotta, Parmesan, green onion and crispy pancetta, served with a brown butter sage sauce, with mixed greens dressed in a twenty year old aged balsamic and olive oil. Main course, macadamia nut crusted tilapia with mango purée, mango lime butter sauce, and pineapple salsa, served with rice and fresh asparagus. 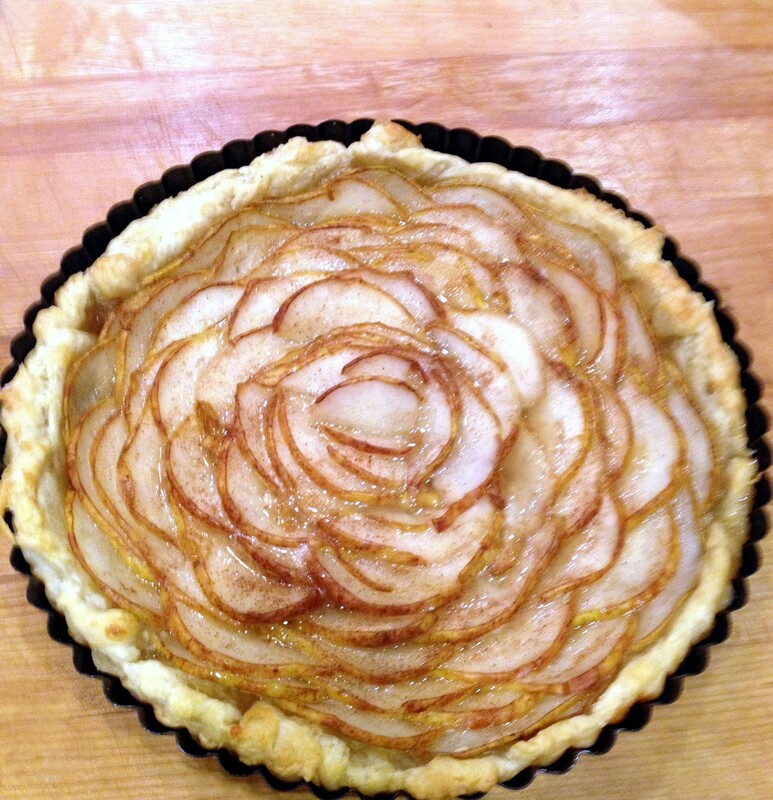 Finally for dessert, puff pastry crust, brushed with white chocolate, that had a touch of almond extract added, with pears, sprinkled with sugar, cinnamon, and ginger, served with homemade vanilla sauce, and a scoop of vanilla ice cream. Have I painted a picture in your mind yet? 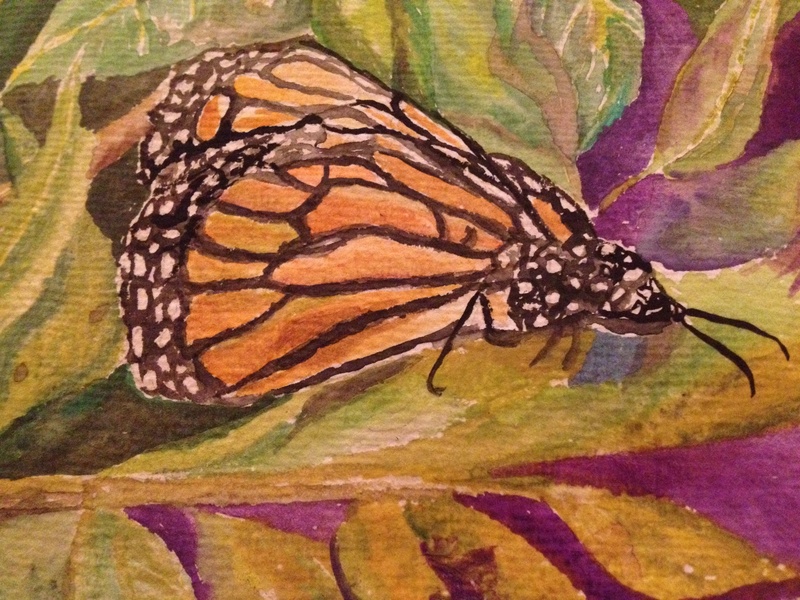 I actually did one small piece of art. 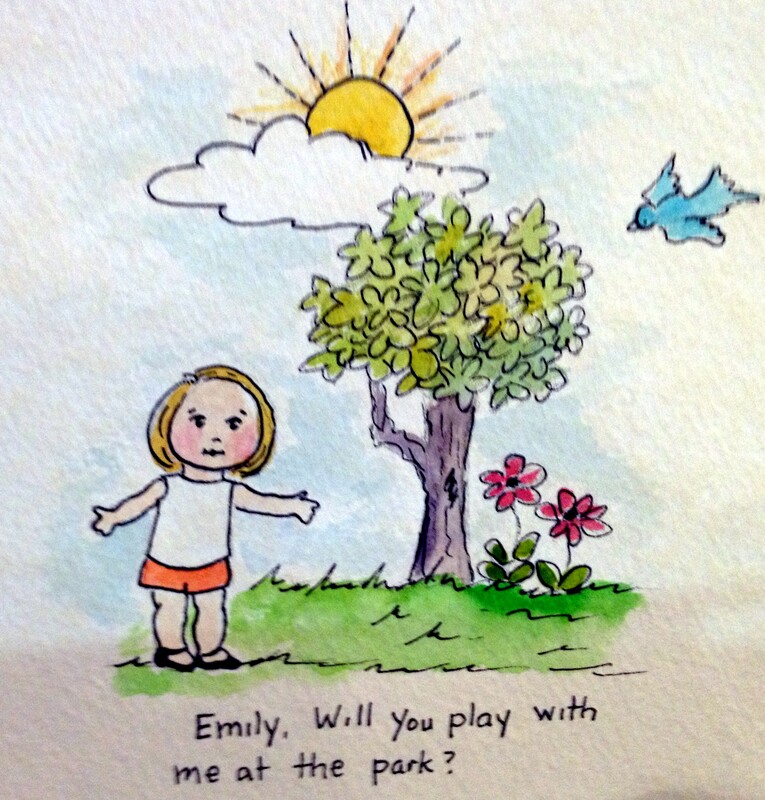 One of my guests was my friend Emily. She is four and a half. I promised her an invitation to play would come in the mail. I started working on it as soon as she left. I may not have painted a masterpiece on paper tonight, but I definitely had a creative day. Back to the drawing board tomorrow. Before I begin writing about tonight’s piece of art I wanted to share a little something. It has to do with the subject I brought up a few days ago, that is my monkey-esque brain and prayer. I suggested that maybe God couldn’t hear me because of all the noise in my head. I happen to be rereading Elizabeth Gilbert’s “Eat, Love, Pray”. It is a book I read a few years ago that I got a tremendous amount from in terms of making me think about a few things in my spiritual life. Elizabeth and I share the same affliction. Minds that don’t know when to quit, although I believe by the end of the book she has hers in containment. I am in the middle of the book where she is in India, and it is where she is searching for and exploring her spirituality. Meditation is difficult for her, and near impossible for me. Someone suggested she focus on someone she cares about. I tried that this morning, I focused on Dan. I focused on my concern, my worry and my love for him while I prayed. I also asked for a sign, anything, anything at all. (Bueller,Bueller…tell me that doesn’t pop into your head every now and then…) I got one, I mean a sign, I actually think I may have gotten two. I won’t go into them, those closest to me know what I’m talking about, mostly because I haven’t stopped talking about it all day. I am grateful to Elizabeth for sharing her struggle, because as I said there was a lot of misunderstanding about what I wrote, and I think if I were to talk to Elizabeth she would get it. So, thanks Elizabeth, and thank you God, not necessarily in that order. Tonight a completely different piece of art. I mentioned my freakish recycling obsession, symptomatic of that is my inability to throw things away. I always think I can use them in some way. My tombstone (if in fact there were one, but I don’t believe in it, think burial is a waste of land, told my kids to cremate me, mix my ashes up with Dan when of course he is available, and use me as fertilizer on a garden. Actually, considering my acidic tongue, hydrangea always were a favorite, particularly blue which needs a more acidic soil…) where was I? Oh yes, my nonexistent tombstone should read, “Don’t throw that out, I can do something with that!” There is my a fore mentioned ability to see things and turn them into other things in my brain, I would imagine this is where my monkey-esque brain comes in handy, because monkeys are very clever. 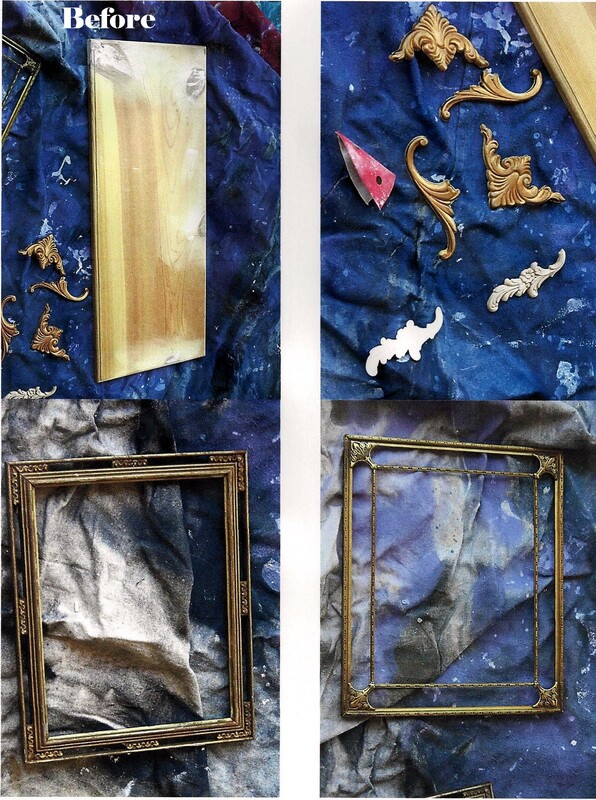 (There is obviously one on the loose in my brain right now) We had a couple of pieces of scrap wood in the garage, I had some old wood appliqués I got from my dad before I moved West, and a couple of cool, old vintage frames in my studio. Dan was kind enough to use his router to shape the edges of the scrap board, and patch and sand where needed. I didn’t prime the wood, too impatient, I spayed the wood, the frames, and the wood pieces in a silver enamel spray paint that I had in the garage. When it was dry I gave it another light sanding, and then painted it using a few different shades of metallic acrylic paint. I printed out one of the photographs I took in Paris, which I had previously changed to sepia, and colorized in Photoshop to the size of one of the frames. 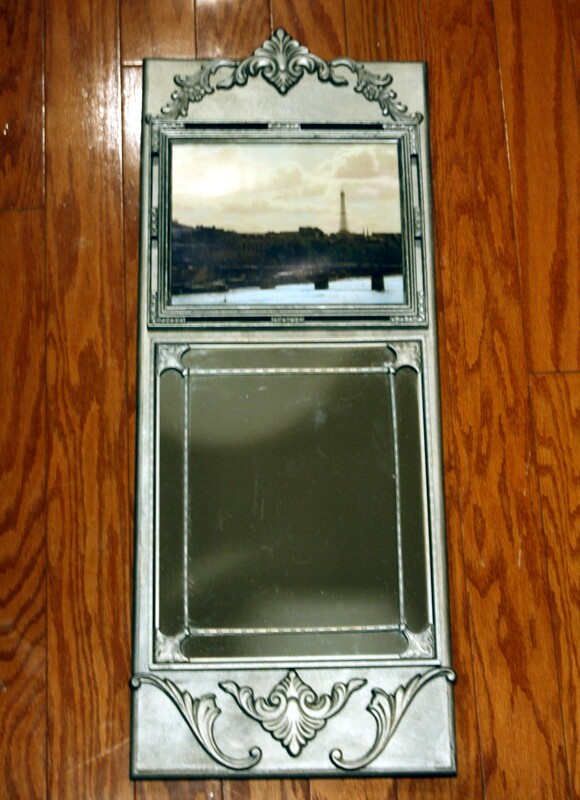 I removed the glass from the second frame and added a mirror from the dollar store. I attached the appliqués, and the two frames to the board. Ta-Dah! Landfill averted. I’m very pleased with the results. I plan to hopefully sell it on etsy. Not bad for a bunch of scrap. By the way, as much as I love “Eat, Love, Pray”, I did not enjoy the movie. Sorry Elizabeth, the sensory delights of your book were lost in that film. Love Julia, love, love Javier Bardem, but really didn’t like the movie. The road block took a hike, I barely started the last of the three portraits I wanted to finish when I let “life” get in the way of my creativity. Tonight I happily sat here (yes, on the white slip-covered couch, but it is watercolor), and am pleased to say that Kylar is just about finished. I am also very happy to say that I’m not sweating this one. When I say “just finished” I mean just that. I’m out of good light for the evening so I will need to finish in the morning. I feel like I made a giant leap in my progression towards artistic confidence here. There was a time where I would have just given up, put half-finished work face down in the studio, never to be seen again. I let my guard down due to stress and my alter ego “not good enough” took advantage and got inside my head. I’m finding it easier to banish it to the basement of my brain. 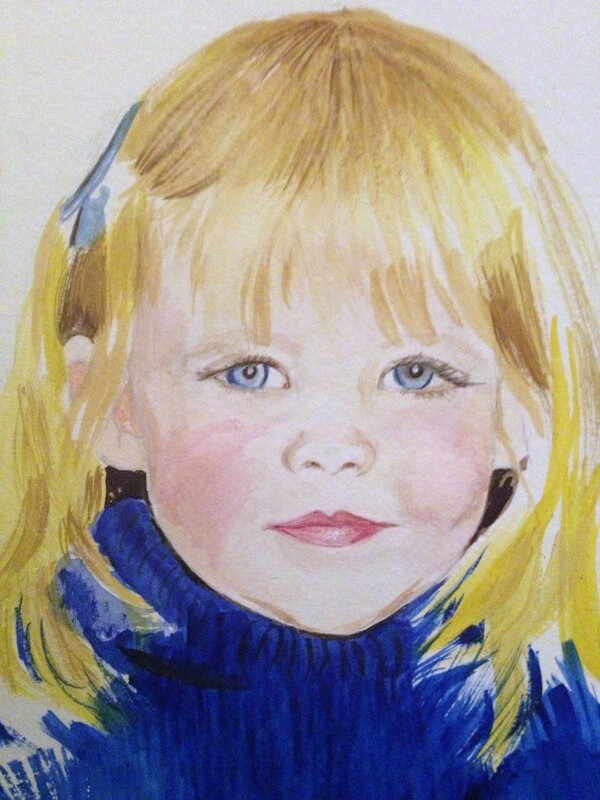 I over worked the last portrait, but it is still good work. With this portrait I could feel myself feeling confident. It’s an amazing feeling to see something develop from my hands. I never take my talent for granted, I know it is a gift, and I appreciate all that I can do. Of course I’d still love to have a great singing voice, or know how to dance, but you can’t have everything, although a little coordination would be greatly appreciated. Despite my minor moment of melancholia the other night, things are good. These are difficult days at times, but there are moments in each of them that bring a smile to my face and lightens my heart. There is of course also the benefit of living with the best friend you’ve ever had, especially when he does goofy things just to see you laugh. The journey continues, and it is never a straight road, sometimes it curves, and sometimes it is has road blocks, but it wouldn’t make for a very interesting life without them would it? Before I begin my post tonight I think I need to clear something up. I think there was an awful lot of misinterpretation of my blog last night. It was after midnight when I wrote that piece. I was tired,and yes suffering from a little melancholia, but I had just finished a wonderful meal, shared with good friends, in my beautiful garden with my amazing husband. I am concerned and worried because my husband lost his job, or as he puts it, “his job lost him”, but I am not a lost sheep. When I spoke of not hearing the voice inside me I was speaking of my own voice. I was kidding when I spoke of my monkey-esque brain getting in the way of prayer, thus the use of the word monkey-esque. When I spoke of being impatient and my prayers not being answered it was in a humorous moment with Dan. I do find myself searching and wondering, but it is not because I find something lacking in my soul. I’m human, I’m worried, and despite the postings of a wife who is concerned for her husband, I have not lost faith. While I truly appreciate the thoughts and prayers sent my way, those of you who know me know that I am rather fond of finding humor in my life, particularly when talking about myself. My faith life is and always has been a private and personal relationship. I can be a bit of a loner, and it suits me to be that way in my spiritual life as well. Yes, we are going through hard times, but that is out in the world, at home I have no empty space to fill. I am a very loved woman, and in that luckier than most. I decided tonight to post something I wrote several months ago with the intention of sending it to my local paper. Shame on me, I didn’t send it, but maybe this is better, this platform that reaches far beyond my local community. If you want to know where I live my spirituality then you need to read this. I am an immigrant. No, not the kind that seems to be of great concern to everyone, the other kind, a pasty white Canadian with parents straight off the boat from Ireland. No one seems to care if I am legal (I am), but that really isn’t the point. For those of you who live in the Temecula area we suffered a significant loss recently. Most of you aren’t aware of it, particularly those who don’t attend our marvelous Saturday Farmer’s Market in Old Town. There amongst the fruits, vegetables, and restaurant fare was a man selling flowers. He wasn’t the only flower vendor, there are two or three others, but he was a gentle man with a lovely smile, and he was an immigrant. He was the immigrant you are all so concerned about, the Mexican kind. My husband and I attend the market weekly. There are many vendors there that recognize us on sight, and with those vendors we exchange pleasant greetings. The flower vendor was different. Week after week we would buy flowers from him and exchange a smile and a “Thank you”. His English was poor, our Spanish is nonexistent. The language barrier didn’t matter, or that we didn’t know his name, and he didn’t know ours, that gentle smile on that weathered face said everything. We became friends. Eventually he began to give me an extra bouquet, something he chose to add to whatever my husband was buying for me. In return I began to bring him a little something I baked, and the gift of a watercolor painting I had done of one of his sunflowers. He disappeared for a while and there was a great deal of concern for him from the people who attend the market every week. I knew this because when we asked about him, his niece told us that her uncle was recovering from surgery, and that it meant so much to her that so many people cared for him. A few months ago he returned. He looked older and a little feeble, but the smile was still there. I know that there is so much anger and even some hatred for immigrants in this country, but there are also those of us who understand who and what they are. My dad came here with a pregnant wife and two daughters because he wanted a better life. I don’t condone illegal immigration, but I wish everyone in this world could have the opportunity that we all have. I don’t know if the flower vendor was legal, I do know that by looking at his rough hands that he probably worked hard all of his life. Maybe we can all set aside a little of our hostility and stop and really look at one another. Many of you couldn’t or wouldn’t do the kind of work that would give a man hands like that. There has to be a better solution than anger. There needs to be compassion and understanding. Two weeks ago when we attended the Farmer’s Market we saw a picture of him surrounded with flowers. The flower vendor has passed away. For those of us who saw him weekly we will miss that smile. I will miss my friend. For those of you that were lovely enough to offer the gift of your faith, your church, I thank you, but I have found mine in the face of humanity. 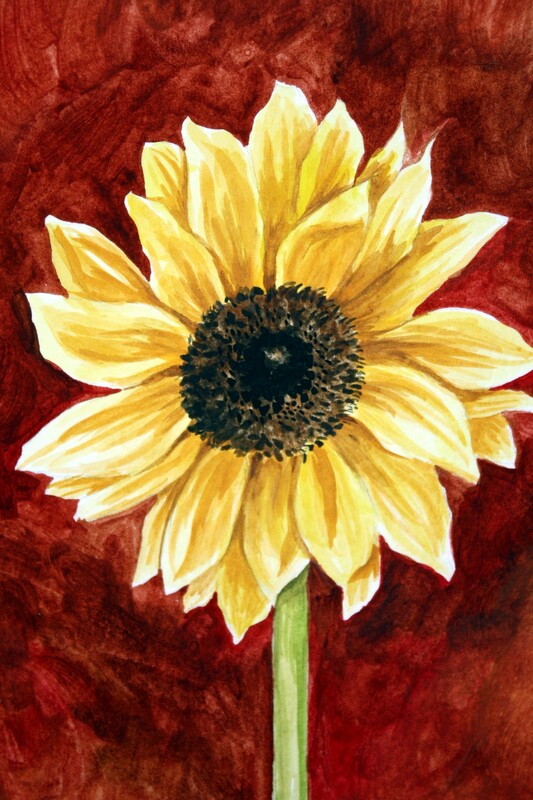 Tonight I am working on the last of the three portraits that I’m doing, but instead of posting the work in progress, I am posting the sunflower I painted for my friend, it’s brilliance could never match his smile. God bless you my friend. Late, late night, so even later post. I worked in the kitchen all day baking bread, making homemade dressings, making Quiche and chicken salad, and much, much more. Its something I enjoy very much. We had friends come for dinner. It unfortunately didn’t leave me much time to create art. I wasn’t sure what I was going to write about tonight. I’m feeling a little off my game. If it’s possible I think I’m having a little case of writer’s block, as well as a moment of shaky confidence artistically. I was reading a book today that mentioned how sometimes our minds are like monkeys, jumping around from thought to thought, its true, at least for me. Last week I wrote about listening to the quiet voice inside yourself, mine must be whispering because I’m not hearing anything. Dan laughed at me earlier because I said I had been praying and I’m getting a little impatient because my prayers haven’t been answered. I told him that maybe they weren’t working because I can’t quiet my brain long enough to be sincere. Then I think maybe no one is listening because I don’t go to church. I stopped going to mass years ago. I go rarely if I feel like it, but mostly if I’m there it’s because my dad is in town. I feel like a hypocrite sitting there amongst the faithful chanting in prayer when I’m creating a grocery list in my head. I feel closer to God out in the world than I do sitting in a building repeating the same words week after week as if I were a robot. We’ve hit a patch of bad luck in our lives, and its starting to take its toll. It leaves me searching for answers and with an uneasy mind. It’s hard to be creative when you feel like you have a black cloud hanging over us. And I do mean us. The best thing about finding that illusive “soul mate” is that when you do, no matter how tough things get, you always have someone to lean on. So I will continue to pray, hope God knows that my monkey-esque mind is trying to stay on track, and maybe let me know someone is listening. Tonight one more for my mother. 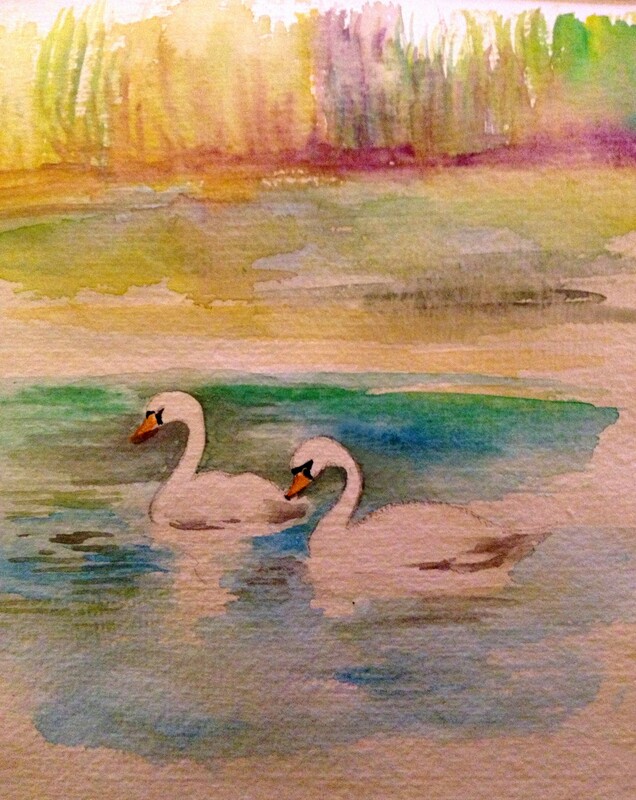 I mentioned a while back about I painting I did while sitting in ICU, it was to hang at her bedside. 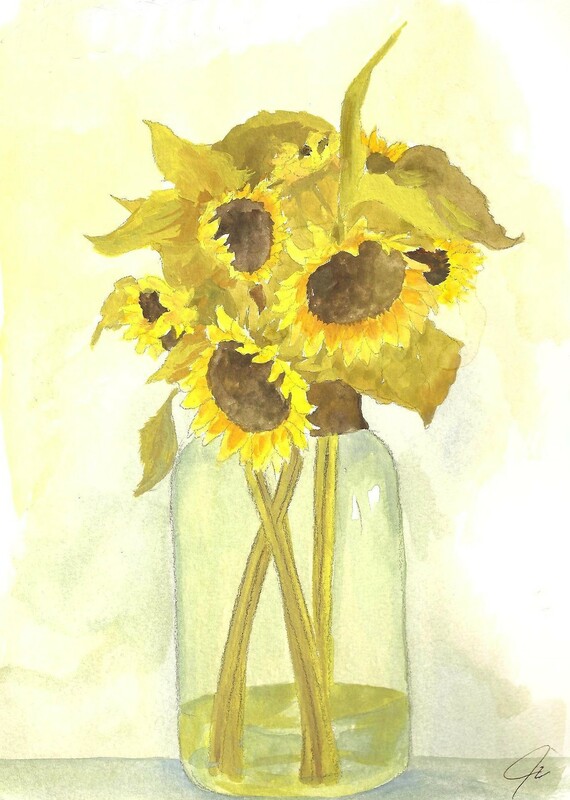 Sunflowers in watercolor. It’s early evening here in Temecula and I haven’t attempted anything new for the day. Busy work in the garage, and to be honest a little stressed about stuff I can’t seem to let go of. There is also this, I know I mentioned it earlier in the month, but today is the sixth anniversary of my Mom’s passing. Never an easy day. I inherited “not good enough” from her. She never realized how fantastic she was. I am hoping that this project will eventually free me from myself, and maybe in some way she will gain something through me. I also realize that my daughter has a hint of the “not good enough” and I want to vanish it from her life too. Speaking of “not good enough”, I mentioned it last night, and boy was it back this morning. I worked on Kelsey this morning because I wasn’t happy about it last night. The other issue is that I wait so long in the day to work that by the time I’m finishing up its dark outside, and I’m tired, and I don’t work with enough light…excuses, excuses, but all true. The stuff I can’t let go of? Perfectionism. I wrote last night of how Kelsey’s portrait didn’t give me any trouble. That was then, this is now. I worked that little baby’s portrait over and over, I almost ruined it by dropping a big blob of water on her poor little face. I finally put it down. I spoke to my daughter Jessica about it later in the morning. She said, “Mom, if they just wanted a picture they’d take one.” She’s right. I need to get it through my stubborn Irish skull that I’m not a Xerox machine (if you are too young to know what that is, google it!) I am an artist, I am evoking a feeling, or an essence, not a Sear’s portrait. I took on the garage stuff today because I needed to shake this off. I was doing so well, progressing and feeling confident. I’m not sure what happened that set me back…ding! Light bulb just went off. Most of the art I have been producing these last few months wasn’t for anyone. There were one or two pieces for Dan and Theresa, but they are like my other halves. 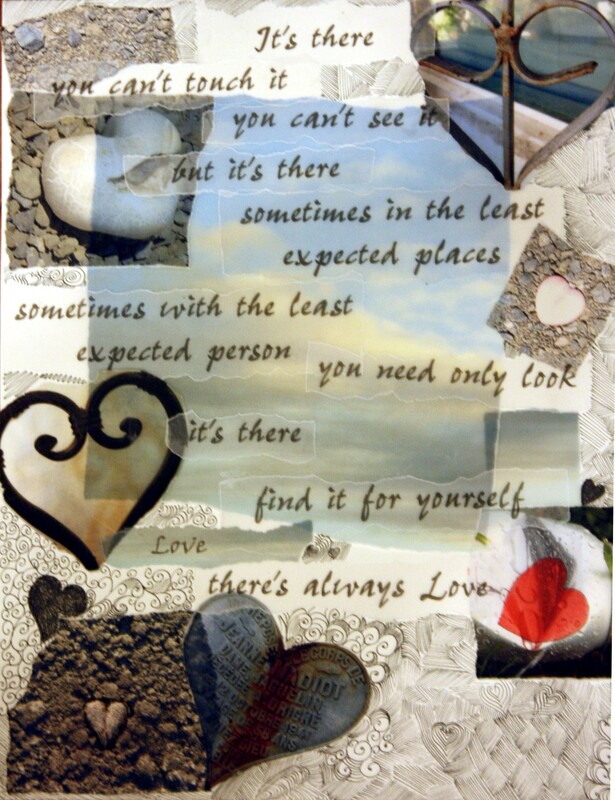 It is because it is for someone else. My new family. Do I think they are going to get the portraits and put a big red check in the middle, or publish a bad review in the local paper, of course not. But I’m me, and I want them to love the portraits of their children. I’m sure they will, because this isn’t about them, it’s about me and my issues. I’m sure I’m slightly insane, and that all will be well. I just have to remember that “not good enough” is very sneaky, and will find the crack in the door if I leave it open even the slightest bit. I talked to Dan about how I was feeling, and of course his words pretty much echoed Jessica’s. I was in fear of being judged, thus the “revisiting”. Finally I just began to cry. It’s a hard enough day, and I make it harder on myself. In the midst of all of it another light bulb moment. There is always a root for every problem, and sometimes the person who planted it doesn’t even realize they are doing it. When I was a little girl, and had already begun to show talent, my dad handed me a photo of John Kennedy and asked me to draw it for him. In my recollection I was around five, but at the very least I was seven, because I still remember where I was sitting when he asked. He walked away and I cried because I didn’t know how to draw that picture and I didn’t want to let him down. Who knows what he was thinking. It’s a sad memory, but Dan said at least now I know where my lack of confidence started. Maybe I should rename the blog “365 Days to Psycho Analyze Yourself”, lots of stuff going on in my head these days. I want to say right now to my two children, if I have ever said something that made you think you weren’t good enough, I’m sorry. You have both always been amazing and the joy of my life. Tonight, something for my mother. When she died her coffin was covered in yellow roses ordered by my dad. I don’t remember yellow roses being her favorite flower, they are his. I know that because my mom told me so. I remember lilacs, and that she smelled like Heaven Scent when I was young. I had some small pieces of wood, left overs from something, they aren’t even cut straight. 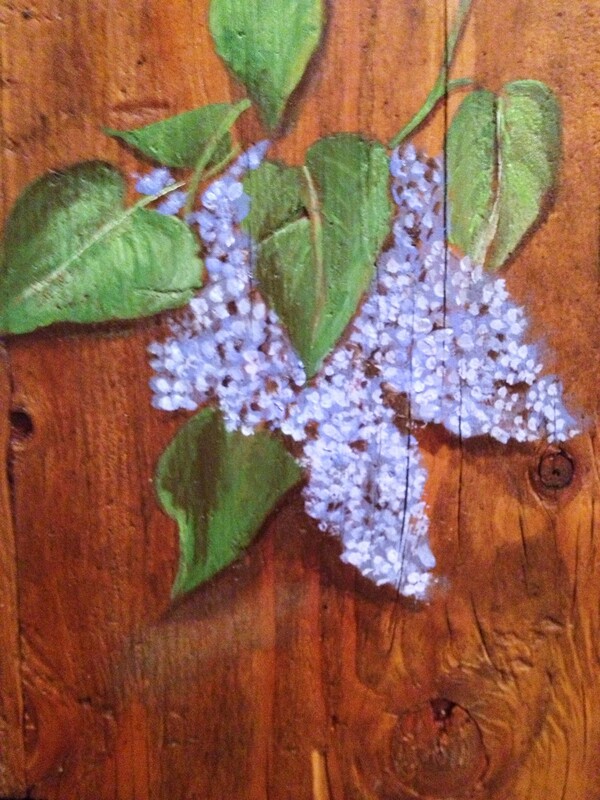 Lilacs in acrylic on wood. Love you Mom.